the defeat sure to raise further doubts over Sarri’s future. Chelsea’s heaviest league defeat since 1996.
after failing to recover from Sterling’s fourth-minute opener. City ground out a 2-0 win at Everton on Wednesday. somehow side-footed wide with his easiest chance of the game moments later. top corner from 25 yards to double City’s after just 13 minutes. when he pounced on Ross Barkley’s slack header towards his own goal. two games when he headed against the crossbar. League’s top scorer on 17 for the season. as he picked out Oleksandr Zinchenko who crossed for Sterling to tap home. 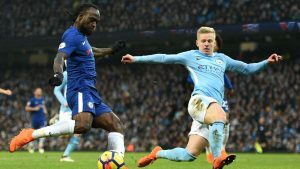 The post Man City hit humiliated Chelsea for six to go top once more appeared first on SABC News – Breaking news, special reports, world, business, sport coverage of all South African current events. Africa's news leader..